After the twin crashes of fall 2008 and late winter 2008-2009, the mood around markets was especially dire. Combined with the 2000-2002 crash, investors who had been involved in U.S. markets had suffered more than a lost decade, when adjusting for investor behavior. That is, retail investors tend to scramble into stocks at higher levels and panic out at lower levels, minimizing gains and exaggerating losses. Off anecdotal evidence, gathered simply from speaking to quite a few in their 40s and 50s at social functions I gathered back then many were never going to return to the market again. Many were at the point they were content to simply not lose money in an investment go forward. Others, due to their age and losses (not including real estate!) simply could not afford any principal loss to what remained, no matter the potential long term gains. I offered this was a substantial change in the psychological risk tolerance of Americans burnt repeatedly by Fed induced boom/bust cycles of the past 15 years. 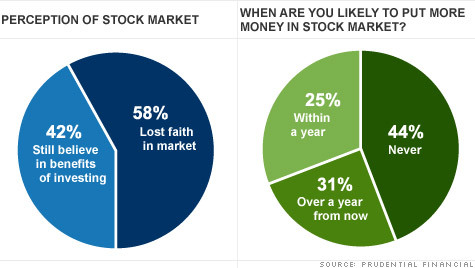 Prudential, which polled more than 1,000 investors between the ages of 35 and 70 online earlier this year, found that 58% of those surveyed have lost faith in the stock market. 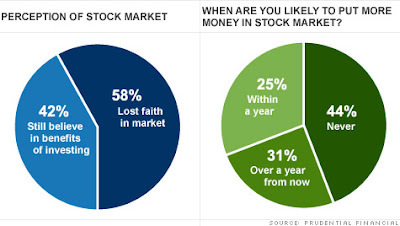 Even more alarming, 44% said they plan to never invest in stocks. Ever. "It's clear that the financial crisis has driven fundamental changes in the way Americans are saving for retirement, with millions of Americans perhaps at even greater risk of having insufficient income for a secure retirement," said Christine Marcks, president of Prudential Retirement, in a release about the firm's survey. "This is similar to what happened in the 1930s. People who grew up during the Depression said they would not buy stocks again," said Ed Keon, portfolio manager with Quantitative Management Associates, a money management firm in Newark, N.J. that is a subsidiary of Prudential. Many investors are distrustful of Corporate America in general and Wall Street especially. "The scarring is very deep and long lasting," said Liz Ann Sonders, chief investment strategist with Charles Schwab & Co in New York. "There's a view that the market is rigged and last year's Flash Crash did not help alleviate those concerns." While we are on the topic, what has been amazing the past few years has been the striking rise in equity markets even as there have been net OUTFLOWS out of equities for the majority of the past 2+ years - only in the past 4-5 months have we finally seen net INFLOWS. So somehow the market had been surging since March 2009 even as money has been siphoned out of the market most of this time. Those of us who live on grassy knolls have our theories [Jan 6, 2010: Charles Biderman of TrimTabs Claims US Government Supporting Stock Market], but we truly have a new paradigm where markets can go up even as money leaves it. ;) Supply and demand rules have been broken.